Crunchy, crispy apple crisp recipe! The easiest of the apple desserts, simply bake sliced tart apples topped with a streusel oat topping, with plenty of brown sugar, butter, and cinnamon. Apples, cinnamon, brown sugar, butter, and oats? Welcome to the essential ingredients of an apple crisp, one of the most simple and easy of apple desserts! This apple crisp recipe comes from my friend Sue Jackson of Littleton, Mass. She introduced it to me years ago and it has since become a favorite. One of the reasons I love this apple crisp recipe is how easy it is to make. It’s as no-fuss as you can get. To make it, you just layer sliced peeled apples that have been tossed with lemon juice and vanilla in a baking pan. Then top the apples with a mixture of brown sugar, butter, cinnamon and oats, and bake! Truly one of the easiest of apple desserts. It’s the crunchy topping that makes the apple crisp “crisp”. The brown sugar, oatmeal, and butter topping mixture caramelizes while it bakes, giving you a blanked of crispy, caramel-y wonderfulness over the baked apple slices. So good! What’s your favorite way of prepping apples for pies, cobblers, or crisps? I highly recommend using an Apple Peeler Corer Slicer. 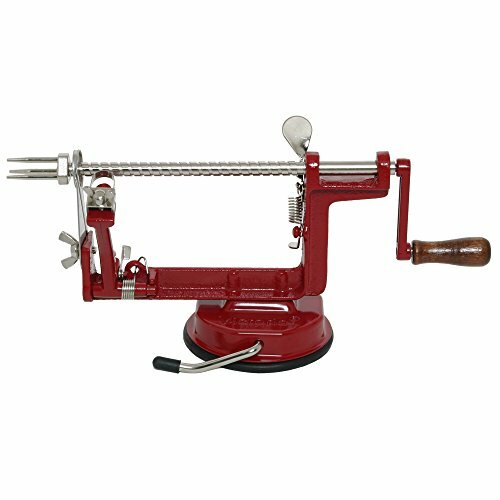 Using one is a quick and easy way to process a lot of apples in just a few minutes. Just like a slice of apple pie makes the best breakfast, so does this apple crisp! Make extra for leftovers, and serve a spoonful on top of a bowl of yogurt. Do you have a favorite way of preparing apple crisp? If so, please let us know about it in the comments. Best Toppings for Apple Crisp! 2 In a mixing bowl, combine apples, lemon juice, and vanilla. Toss to combine. 3 Layer apple slices in baking pan: Layer sliced apples in a 9 x 12-inch (or approximately the same size) baking pan. 4 Make topping: Combine brown sugar, cinnamon, and oatmeal in a bowl. Cut in the butter. Sprinkle sugar mixture over apples. 5 Bake: Bake at 375°F for 45 minutes or until topping looks crunchy and apples are tender. Hello! All photos and content are copyright protected. Please do not use our photos without prior written permission. If you wish to republish this recipe, please rewrite the recipe in your own unique words and link back to Apple Crisp on Simply Recipes. Thank you! This apple crisp is amazing! The crispy topping and the soft warm apples is heavenly! So easy to make as well! Yummy, yummy, yummy! Lovely caramel-ly topping. The vanilla gives a subtle and smooth undertone. I added some lemon zest which sparked up the Cortland apples. I will definitely add this to my favourites! I made this as a last minute dessert for my gluten free dinner guests. It was an absolute hit! I would highly recommend this recipe! I compared this recipes to a few others, this seemed the easiest…so tried it. I added a few tablespoons of flour and have to say this was delicious! Will definitely add it to my recipe collection. I like this better than apple pie. Your site has not steered me wrong. Delicious and easy to follow. I added more oats and chopped walnuts to topping, less butter, ground nutmeg (1 tsp. ).Then I added craisins with the apples. Yummy. This is a recipe that you can change slightly every time. This is WONDERFUL. Your recipes are always so reliable. They are easy to follow and the results, invariably delicious. After many years of following, this site is still my ultimate go to. Thank you! I just made this dessert for mom last night and she loved it! It was so yummy I’m definitely going to make it again! Thanks for the recipe! I just made this and it smells amazing!! I reduced the sugar to a 1/2 cup and substituted raw turbinado sugar. I also added a 1/2 cup of chopped almonds to the oatmeal mixture for a little added flavor and protein. Using less sugar and adding the almonds makes it healthy enough for breakfast! I also left the peels on for added fiber. Oh so delicious. Easy enough for my kids to follow the recipe! We made it for breakfast and ate it warm with vanilla yogurt. Absolute hit on the fall morning when there is no school. Thank you! My grandma and I made this for Thanksgiving, and it turned out delicious! We ended up added 1/2 teaspoon of nutmeg, 1/2 teaspoon of cinnamon, and 1 tablespoon of white sugar into the apple mixture. Made this recipe for my family’s annual Harvest Party. Since a lot of my family members are sugar sensitive, I used Splenda brown sugar and it was a huge HIT!! I doubled the recipe but not the butter and also used TWO different kind of apples, cubing one and slicing the other (just to make it different). I say, good enough for a repeat!! This apple crisp is delicious! It is best topped off with some vanilla icecream… Great recipe, thank-you! Thanks for sharing this fabulous recipe! After reading through the comments I decided to add my own special flare…chopped prunes, fresh grated ginger & Tbls of vanilla agave syrup to the apple mixture. My apples were quite tart. Not as simple as the original recipe but excellent results well worth the effort! Yum! After searching a number of similar recipes, I tried a version of this in combination with some of the other ideas I found and used no butter at all. For the topping, I just used flour, brown sugar, rolled oats, walnuts, 1 tsp cin, about an 1/8 of nutmeg, pinch of salt and just a a tad of honey. I put my mixture in small ramekins (I made an mcintosh/plum mixture with about a tbsp of flour, a sprinkling of corn starch, 1/2 a fresh-squeezed lime juice, some zest….some went in the topping, too….a little brown sugar…just a tad, since I didn’t follow directions and used all the flour/sugar ingredients for the topping). The first time I made it, I used the juice of a whole lemon – too much. Second time – just half a lemon for my mixture which went into four small ramekins. Much better. I put the oat/sugar/flour mixture on top. I really packed in my fruit, since it cooks down and packed my oat mixture on top. The first time, I just sprayed my Pam Baking spray on the tops (just a small amount to coat). I also squeezed a little honey on top, making a very light circular design on top. I baked for about 25-30 minutes. The topping came out fully cooked, browned and just the right crunchy consistency. For those who do not want to use butter, you will not miss it, at all. All the ideas and versions here sound great, including the original. I’m a college student and had apples shipped to me from home. This is one of my favorite desserts and with the fall weather coming I wanted it so badly. Whenever i’ve made this with my mom and sisters we actually leave the apples with the peel on them, and i love the crisp part so i double that to make it even crispier…. a bit unhealthy though with the butter. Susan, what were the measurements of those ingredients of that hard sauce topping your mothers used? Was comparing your recipe to the one I have used for about 40 years and it is about the same. I do add a couple of tablespoons of flour to the topping. I think the occasional sogginess of the topping experienced by some, may result from using margarine vs real butter. Always had this in the cafeteria when I was a student. The ladies (our mothers) made a hard sauce to top the crisp. It was simply butter, confectioners sugar, vanilla, and nutmeg. Kind of stiff and a spoonful melted over the warm apple crisp was to die for. Will try your version tonight for the super bowl dinner!